Early in 2007, my life – as well as my family’s – was altered forever. This change came in the form of an humble middle-aged man named Tong Phuoc Phuc whom we met in an underprivileged neighborhood in Nha Trang, a resort town that is eight hours from Saigon. Mr. Phuc and his wife live in a tiny brick house, no more than 10 feet by 45 feet. They are gracious hosts to an unlikely group of guests – twelve expectant mothers and twenty-two toddlers, ages 1 to 3. Over the past three years, the Phuc’s modest dwelling has become a sanctuary for young mothers-to-be, as well as for orphans who have no other place to call home. Mr. Phuc began his cause four years ago when he started collecting aborted fetuses from a local hospital and burying them in a near-by cemetery. He named each life lost and honored their memory in a ceremony. Over time, he has laid to rest over five thousand fetuses. 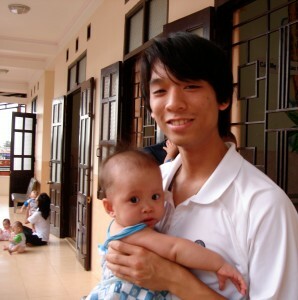 Mr. Phuc was so affected by this cause that he invited young expectant mothers into his home who would have otherwise had abortions. After the birth, he has given the mothers the option of either keeping the babies or giving them to him. Surprisingly, fifty percent have chosen to keep their babies. After our emotional visit, our son David was so moved that he told us he wanted to help those children, to provide a better future for them. He wanted us to build an orphanage and, after much thought, my wife and I agreed to start a fund to construct the orphanage and raise money for its long term operation. 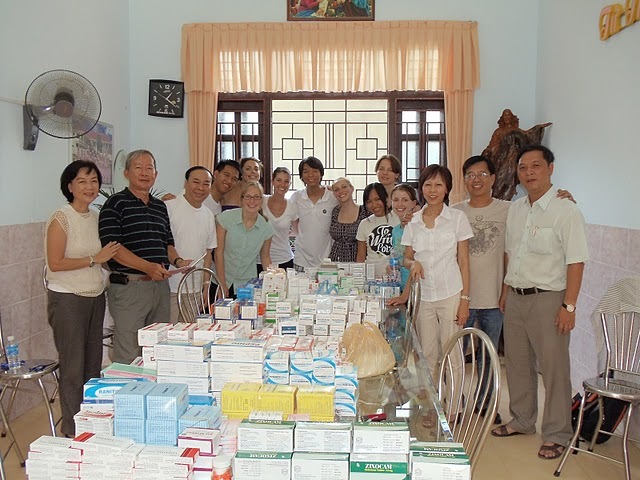 We joined hands with Sister Thanh Mai and the nuns from the Holy Cross Society (Dong Men Thanh Gia). 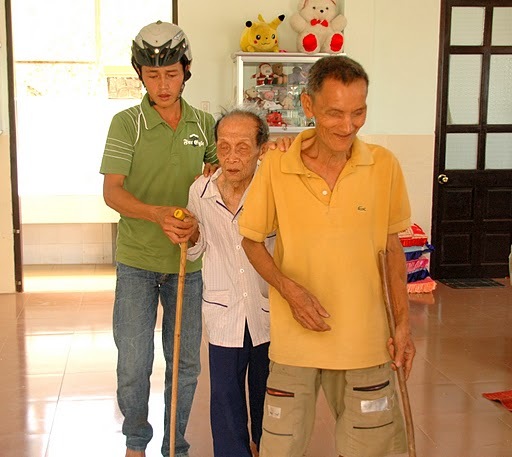 With contributions from our family and generous friends, we were able to build the orphanage in the village of Ham Tan, thirty minutes south of Phan Thiet and three hours north of Saigon. The orphanage was completed in March of 2009 and is a two-story building with the capacity to house and feed over one hundred orphans, a dozen young expectant mothers, and several nuns. In addition to the living and dining quarters, there are also two large classrooms and a chapel. In order to provide long term support for the orphanage, we have created a non-profit organization called “New Beginnings-Mai Am Inc.” (Mai Am means Warm Roof in Vietnamese). We want to ensure that the children will be well cared for and given a chance to grow up in a healthy, stable environment. Hopefully, they will become not only proud, but productive members of society. I hope you will consider contributing to our cause and helping us provide these children with a warm roof over their heads, as well as a new beginning. Any contribution, small or large, will be deeply appreciated. Only thirty dollars will feed one child for a month. For $360, you can sponsor a child and provide food for an entire year! Our next goal is the purchase of the land close by. We want to buy the property to build an additional dormitory to separate the boys from the girls and to build a small clinic to provide medical care to the handicapped children and the poor peasants in the village.� In the future, we would like to teach the children English so they can be more competitive in their lives as they will face the stigma of being orphans. We would also like to teach the young expectant mothers a marketable skill to make a decent living after giving birth. Donations are tax deductible. The New Beginnings Mai Am organization is a non-profit 501(c)(3) organization. Our EIN is 61-1540767. These young mothers and children need our assistance. Please join us in our efforts to continue to provide for these children. Unite with us to aid these little ones who cannot help themselves. The gift of a new beginning is life-changing for us all.